The 1848 CAL. Coronet Quarter Eagle was made from gold mined from the California Gold Rush. Gold was discovered at Sutter’s Mill near Coloma, California on January 28, 1848. The find set off a mass migration of fortune seekers to the American West. "As many may wish to procure specimens made with California gold, by exchanging other coin for it, I would suggest that it be made into quarter eagles with a distinguishing mark on each, if any variations from the ordinary issues from the Mint would be proper and could be conveniently made ..."
Mint Director Robert M. Patterson arranged to have the “distinguishing mark” added to the 1848 Quarter Eagle by utilizing a simple CAL. punch. Most experts are convinced that each CAL. coin was punched while still seated in the die, because there is no detectable obverse damage on any known examples. The CAL. letters were intended to indicate the coin was made from California gold. An estimated 1,389 of the 1848 CAL. Coronet Quarter Eagles were minted. Coin collectors of today regard this coin as one of the most significant pieces in American numismatics. Its origins can be directly linked to one of the most important episodes in all of United States history, the California Gold Rush. The blue line above graphs the percent value increase of the 1848 CAL. Coronet Quarter Eagle in F-12 condition, starting at Year 2000 as a baseline. The performance of the 1848 CAL. 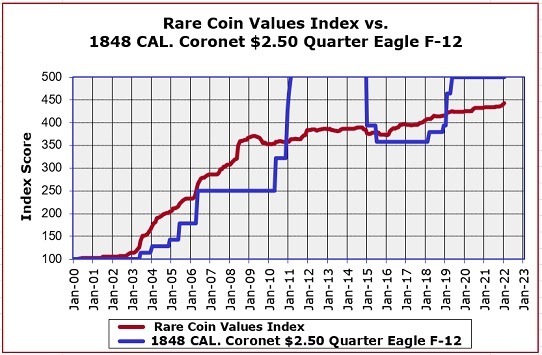 Quarter Eagle rates a little below the Rare Coin Values Index, as depicted by the red line, but has shown very good upward consistency. The Index illustrates the percent increase of a group of 87 rare United States coin chosen from across the range of United States numismatics. The objective of the Index is to estimate the state of the US rare coin market. All Index data is updated monthly.